Popular by Bukit Doa Tomohon, this place is also familiar with Bukit Kelong, Tomohon great garden or Mahawaru Prayer hill. Bukit Doa Tomohon is a location that has cross path; the path is not in the shaped of the cross, but the way it tells the story of Jesus before being crucified and in this hill there are also several locations that tells some stories about Jesus. In addition to the spot that tells about Jesus, there is also amphitheater and Chapel of Mother Mary, regarding that this is a worship place for Catholic follower. The name of the chapel is Mary Chapel because the first founder is Mrs. Mary Wewengkang. 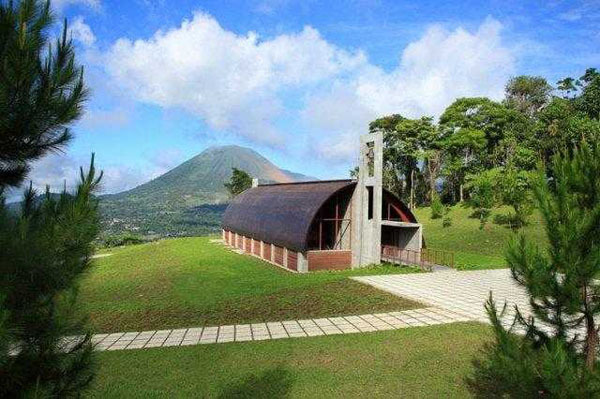 This chapel has unique and beautiful shape of architecture and decoration; the landscape outside the chapel is also stunning, where we can see Mount Lokon that is still active. Viewed from the outside, this chapel roof forming curved shape like a half-tube, and it has a sizable entrance at the back and have a few windows, it much similar with the front side that facing Mount Lokon, decorated with almost all its parts are made of glass. Around the chapel, the green grasses are planted and make the nuance becomes shady and beautiful. Hence, there are couples that reserve this place for wedding matrimony or just taking pictures for pre-wedding photo. On the other side of the cross path or Via Dolorosa is also interesting to be enjoyed. At this path is being told about the events before Jesus was crucified; there are 14 stops in the cross path, which in every stop there will be depictions, icon or something that reminds about it. Moreover, in every stop have human-sized sculptures that visualize the story. The first visualization is when Jesus condemned to death, then the moment that describing Jesus was tried and decided to put to death by crucifixion. The amphitheater around the hill is available for act performance, that have been facilitating by acoustic system, tribune seats for 1500 people and little cave for 1,5x1,5 with the sculpture of Maria inside it. The atmosphere around the hill is very comfortable for contemplating and enjoying the nuance. During Easter, the place will be more crowds by the participants. To get to the location is very accessible by public transportation, the main road is already paved, so it gets easier to visit. For those who ride the bus can ride a bus majoring the route Manado - Tomohon in terminal Karombasan up to Tomohon terminal. After arriving in Terminal Tomohon, we can take direct public transportation to the hill of prayer with Rp 3,000 to Rp 4,000. After that, we have to walk about 15 minutes to get right on the hill. For those who using private vehicles or rental car can go through the main route of Manado-Tomohon. After arriving in Tomohon there will signs that showing the route to Tomohon Prayer Hill.